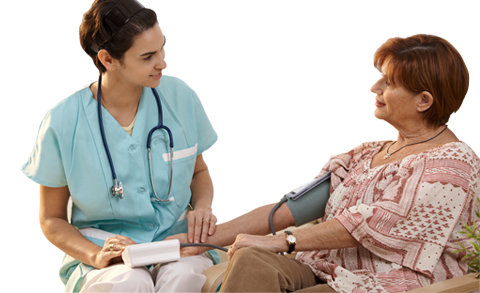 Have you had your blood pressure checked? 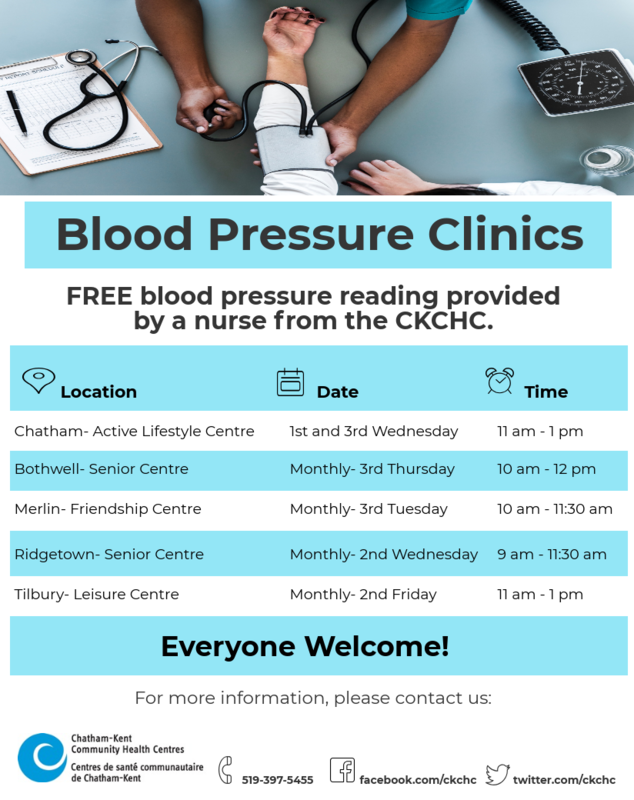 Performed by a Registered Nurse, these clinics are available at various locations and events throughout Chatham-Kent. For more information, please call 519-397-5455 ext. 131 or click here to view our flyer. 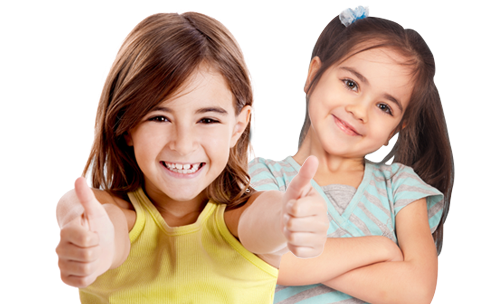 This is a continuous monthly drop-in program that provides participants with pre- and post-natal education, nutrition information, and health and safety information. A cultural cooking class also occurs. Child care is provided. This program is in partnership with the Ontario Early Years Centre, the Chatham-Kent Public Health Unit and the Living Faith Community Church. Available only to Low German families. For more information, please call 519-397-5455 ext. 158. 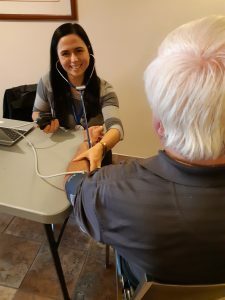 A drop-in program facilitated by two Health Promoters that provides participants with a safe and supportive environment for casual conversation and social activities. For more information, please call 519-397-5455 ext. 113. Self-care begins with a fresh cut! Monthly haircuts are provided by our talented volunteer hairdressers. Appointment required. For more information, please call 519-397-5455 ext. 322. Brush up on your creativity! This is a weekly drop-in painting program led by a volunteer artist. All skill levels welcome. For more information, please call 519-397-5455 ext. 117. 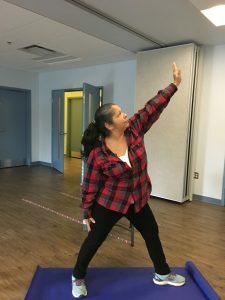 Facilitated by a Physiotherapist, the aim of this program is to promote the self-management and prevention of chronic health conditions including diabetes through education and safe exercise. This program runs for 12 weeks and is customized to the level of fitness of the participants. For more information, please call 519-397-5455 ext. 2. Don’t get bugged by the flu! Vaccines are available at one of our three sites during the months of October and November. For more information, please call 519-397-5455 ext. 117. The freshest you, on a fresher budget. This is an interactive 4-week learning series in which participants will learn basic cooking skills such as measuring, chopping, calculating yields and using kitchen equipment. Led by a Registered Dietitian, participants create their own supportive and encouraging atmosphere while boosting their confidence and knowledge. Each session provides participants with a chance to make and share a meal, take home leftovers and learn about a new healthy eating topic each week. For more information, please call 519-397-5455 ext. 138. Participants in this biweekly program enjoy a light meal while learning about healthy eating habits and budget friendly dietary choices. Participants are also encouraged to assist with the meal preparation. For more information, please call 519-397-5455 ext. 306. A monthly program that transports participants to a local grocery store for a tour and educational sessions. Led by a Registered Dietitian, participants also have the opportunity to shop after each session. For more information, please call 519-397-5455 ext. 306. This is a weekly walking club designed to motivate participants to be more active, while socializing and learning about topics related to wellness, nutrition and physical activity. For more information, please call 519-397-5455 ext. 117. Are you having to travel out of town to see a physician, specialist or healthcare professional? With Telemedicine, you will be able to see, hear and talk to a specialist, physician, social worker, dietitian and any other healthcare professional live on a television screen. With the assistance of a Registered Nurse, Telemedicine allows you to visit your physician, specialist or healthcare professional without leaving town. It is private and free! For more information, please call 519-397-5455 ext. 249. This service incorporates First Nations healing and wellness by including prayers, traditional medicines and practices or ceremonies. Monthly healing services and teachings are provided by various Traditional Healers. For more information, please call 519-397-5455 ext. 315. Do you have arthritis? Joint problems? Led by a Physiotherapist, this 8-week pool-based program helps participants reduce their pain with gentle exercises. For more information, please call 519-397-5455 ext. 212. A yoga class for beginners! This weekly program offers less challenging movements in a chair for those with chronic pain and other conditions. For more information, please call 519-397-5455 ext. 326.